This week for my senior capstone game I have been working on designing mechanics for our cooperative mech game that would cause the players to have to work together. There are lots of games in the current market that have heavy emphasis on cooperative play games like Left 4 Dead, Evolve, Borderlands, and Destiny. Co-op play is not a new concept and with the advent of online gaming it has only gotten more popular, however the question remains how does a designer get players to work together? One of the most popular ways to get players to work together is to create enemies that can incapacitate a player. Left 4 Dead does a great job of this, in Left 4 Dead 2 four out of the eight special zombie types incapacitate a player with their attacks. When one of these enemies attacks a player they are unable to move or fight back until an ally kills the enemy, this encourages players to stick together and heal each other because a lone player can easily be picked off. Another game with great examples of enemies that force players to work together is Army of Two. Army of Two is a game created from the ground up with co-op in mind, there are many types of enemies that have heavy armor in the front this creates a need for the players to flank. One player usually draws the enemies attention while the other player shoots their weak spots. Another popular way to encourage teamwork is to create different character classes for the players to pick. This allows the designer to create objectives that only certain classes can complete, if the players know they need a certain person alive to complete the level they will work together to protect that player on the way to objectives and while they are completing objectives. When each player is a different class they bring more tactical options to the table and this creates a symbiotic relationship. In the game Resistance 3 there is a co-op campaign where each player has different abilities one player can heal others but they don’t have many offensive capabilities so it behooves the other players to protect the healer so they can last longer. Some games use puzzles to encourage co-op play, games like Portal 2 have co-op campaigns that are all about solving puzzles as a team. This method can be a very good way to encourage teamwork, the players will not be able to progress further in the level until they work together to solve a puzzle. The danger of this method is that if one player has done the puzzle before they can just tell the other player what to do and that eliminates the need to really work together. The methods I discussed above are by no means the only way to get players to work together, there are tons of other ways to get players to cooperate. When I was thinking of ways to encourage player teamwork in my senior capstone game I looked at a lot of co-op games and how they solved this problem. One of the mechanics that I came up with for my game was to have a super powerful weapon that requires both players to maximize its effectiveness. The pilot fires a slow moving projectile that deals average damage, the engineer can then shoot the projectile to make it explode dealing high area of effect damage. This encourages communication and rewards the players for working well together. 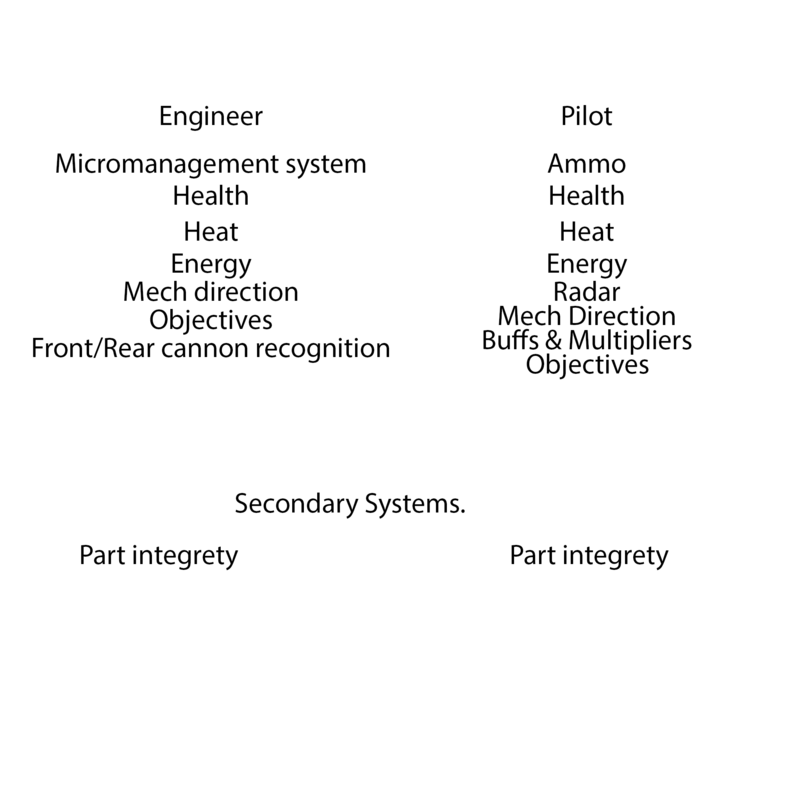 I also created a mechanic where the engineers UAV has to be refueled by the Pilot. The UAV is very useful in combat and its in the pilots best interest to keep it fueled so that it can keep scouting and supporting the pilot. When designing co-op mechanics the biggest thing to remember is to make sure both players feel equally powerful, if one player feel less powerful then the other then they will get frustrated and not want to continue playing. If any player does not feel like they are contributing to the team then they won’t see the point of playing and as a designer you want to keep players invested as long as possible. When making video games, creating documentation is a very important part of the process. Documentation can be helpful in many different ways such as documents can be used to help keep the team on the same page about design changes, they can also be used to help explain game play to investors or publishers, and can also be used to help you arrange your ideas and think about the game in different ways. Personally I like to start making my visual design docs by sketching out some ideas, sometimes I will sketch out three different layouts that I may use and sometimes I have writers block and I just doodle. Even if I don’t come up with something I can use later this process helps me get in a creative mindset and also allows me to get any of my basic ideas out. After I’m done drawing I start doing a digital block out of my document and at this point I decide how the page is going to be laid out and how much space I will need for each thing I want to talk about. I will write a headline for the mechanic or game feature I want to talk about then I create a large square to represent how much space I need on the document to talk about that feature, this gives me an idea about how big the document needs to be. Once I have the whole document blocked out I finish up my first pass by adding art and any text I need. After the document is finished I always show it to the team for feedback, its always good to show it to at least an artist since they may have some suggestions on how to change the layout of a document to help with flow. When the team is finished giving me feedback I go and make the changes and the document is done. I really like making game design documents, it forces me to think about how all the mechanics work together and it gives me a way to show the rest of the team what my design plans are.